Vinayaka decorators We provide Decoration services for Memorable Occasions like Wedding, Reception, Betrothal, Birthday Parties, House warming, Religious Ceremony, Social get-together, Corporate Events, Conferences, Meetings, Family Gatherings, Anniversaries, Stage Shows, Exhibition and so on. 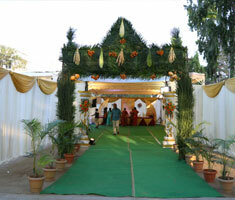 Vinayaka Decorators & Event Management Providing A to Z of Marriage Decoration services, since the year 1995. Our services include Decoration for Memorable occasions like Marriage, Reception, Religious Functions, House Warming, Birthday Parties, Upanayanam, Betrothal, Social get-together, Corporate Meeting's, Stage Shows, Exhibition's, Etc.. 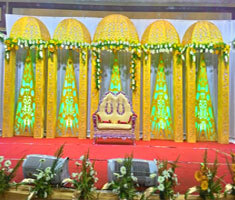 Wedding Stage Backdrop, Event Backdrop, Flower Manavarai. Red & Green Carpets, VIP Chairs, Plastic Chairs - Arm & Armless. Manavarai Flower Decoration, Fresh Flowers Decors coimbatore. 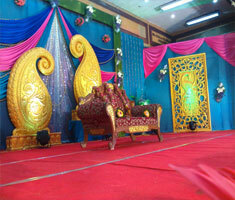 Special Green Pandal, PVC Pandal, Wedding Pandal, Vazhai Maram. Entrance Lighting, Stage & Building Lighting, Audio System. Chepandis, Canopies, Round Tables, Banquet Chairs with Covering, Carpets. Entrance Backdrop, Exhibition Backdrop, Floral Arrangements. Bouquet Arrangements, Garlands - Rose Petals, Carnation Flowers, Lily, Malli. 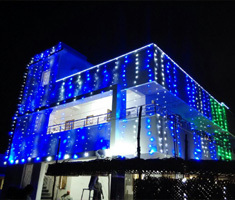 Vinayaka decorators, leading best wedding decorators in coimbatore. Our innovative team makes your dream venue to be real and live through dedicated professionals. 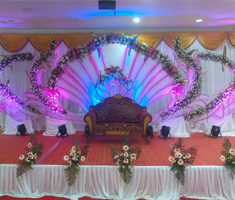 Our professional Services include backdrop, event managements, entrance decorations, Flower arrangements, Professional audios, Building lighting, PVC Pandal, beautiful garlands, get together arrangements, Buffet Arrangements, Seating arrangements, Manavarai, Balloon, pandal decorations and many more for all your special occasions. (11th April) : Awesome...Everybody gave very Beautiful Compliments..Thank u so much. (3rd April) - Really Excellent Service Jee.Had a wonderul time.Enjoyed Well jee. Thanks. It was good.will get in touch with u for future Requirements. Hi, Decoration & Other Arrangements were Good. Awesome. U all rocked the whole Event. S function went on well. U did ur work Perfectly & on time. We are very satisfied with your service. Keep It up.